I’m hesitant to call any piece of media straight up “feminist” without a lot of thought. There are so many ways a cultural product can uphold feminist values and do feminist work – from content and character portrayals to the role of women and marginalized people working on the writing, direction, and production side. It’s not just a film’s content, but how the story is created and crafted, that can have feminist aspects and be informed by feminist ideas. There are, of course, so many ways to engage with feminism in media and fiction, but nothing about the original Star Wars films, or the prequels, really screamed feminist trailblazers. And yes, doing more than giving birth and dying isn’t enough to make a film a feminist paragon, but it’s a start. And The Force Awakens does do more. SO MUCH MORE. While I love science fiction, science fantasy, and everything to do with space, the original films appealed to me more as a child because of adorable beeping droids and Ewoks than because of female role models. Watching the original films as a kid, I didn’t really imagine women Jedis. I thought Leia was cool and I understood her – she was, to me, a Warrior Princess. I loved She-Ra. I watched Xena. Warrior Princess fit a larger script. But, to me, she was a Princess first. 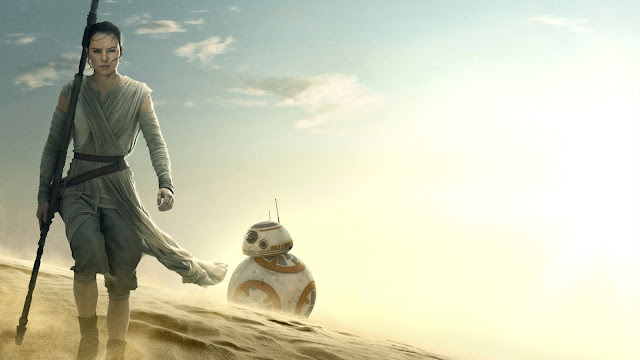 Having avoided looking too deeply into previews or speculation on the new film, I glimpsed a lot of imagery around the new character Rey (played by Daisey Ridley), but I didn’t dare to hope that she would actually be the main character, a skilled pilot and mechanic, a natural fighter, and a ~*JEDI*~. A Star Wars movie...with a main character who is a woman...and has the Force. What does it means that I was genuinely surprised? There is nothing surprising about male heroes. In fact, we don’t typically even need to qualify their gender except in this context – they are just heroes. They are unremarkable and normalized. No one questions if Luke’s use of the Force is *real* – real, genuine, manly Force-use is presumed. 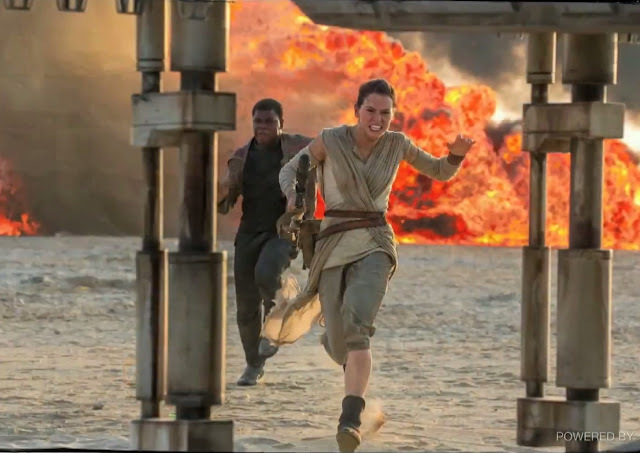 The way I see it, the Star Wars franchise is all about The Patriarchy – in the literal sense. At its core, it’s a story about lineages, of various sorts: fathers and sons and (male) Jedi masters and (male) student Jedis. The Empire Strikes Back’s big reveal is basically an elaborate paternity test result. Darth Vader and Luke Skywalker’s estrangement on opposing sides of Light and Dark is a major arc, repeated and reimagined through the relationship of Han Solo and his son with (now General) Leia, Ben Solo, who becomes Kylo Ren of the First Order and is well on his way to following in the footsteps of grandpa Vader. With the release of Mad Max: Fury Road (read my feminist discussion of this film here) earlier this year and the incomparable Imperator Furiosa, not to mention the recent final Hunger Games film installment and my deep appreciation for Katniss Everdeen, I didn’t dare expect that The Force Awakens would have such an important female lead. But maybe I should have, as films pivoting around powerful women characters become less atypical. As we can recall, Luke and Leia were poised as potential love interests back in the day before it was determined that – oops, siblings! – and then she was quickly paired up with Han. It’s still too early to see how Rey’s story evolves, but those of us attuned to watching closely for gender conventions (and shouldn’t we all be watching!) noticed how Rey and Finn are depicted as close, caring, devoted teammates, but not as explicitly romantically interested in each other. Rather, more importantly, while I at times anticipated some interest in Rey on the part of Finn, Rey was clearly portrayed as having other, larger preoccupations than romance. And then...and then: Just when I started to panic that the major lightsaber duel would play out between Kylo Ren (who looks like an Evil Justin Trudeau circa 2011, right?) and Finn, Finn gets knocked out and Rey takes up, like, uses her Force Power Seize Telekinesis, to use Skywalker’s lightsaber to battle. How compelling to see such a fight scene. And while I’m sure there are ample criticisms of the film for its female Jedi-in-training lead character lurking around the Internet and comments sections, I have yet to hear much criticism grounded in frantic cries of “OH NO FEMINISM!” As Tasha Robinson writes “It’s inevitable: The anti-Rey backlash is coming.” Strong female characters, like strong actual women, tend to be very threatening to The Patriarchy, it would appear. I spoke too soon: it seems there’s been a lot of discussion critiquing Rey, as a character, for being a Mary Sue, a “term... rooted in a long history of dismissing female characters and holding them to absurd double standards” (read this great overview of the issue by Nico Lang for Salon here). Still, overwhelmingly, critical reception has been positive and fanfare has been deafening. Unlike Mad Max: Fury Road, and the widespread discussion of the film’s “feminist propaganda” as a detriment (to a few dudes, anyway), I haven’t heard much in the way of claims of feminist propaganda for The Force Awakens. Are we starting to just accept good films with excellent, smart, strong, powerful women as just good films? Are we there yet?